After some Christmas Feasting at my mother's house - a yearly tradition for Christmas Day Turkey lunch and Boxing Day Chinese Feast (lobster/crab in Spring Onion and Ginger, Chinese Roast Duck, Roast Crispy Pork are definite contenders), we were lucky enough to be invited to two other feasts over the weekend. I recently learned that one of my cousins will be going away to work in February and it's been long talked of having a Steamboat Feast. One of our other cousins hosted the meal at their place and as I like to bring a little something along, I baked a Green Tea Chiffon for dessert. Post for that one is here. I have discovered that I omitted to take photos of our feast :( But I will tease you by telling you that we had three different kinds of noodles; 3 different greens (pak choi/cos lettuce/chrysanthemum greens); 3 different meat balls (fish/pork and beef); thinly sliced beef rolls; fresh prawns; fresh clams; mushrooms (brown chestnut and golden needle-enoki). The Steamboat pot was split in two compartments and we had two types of broth, one was a herbal tonic, the other plain. The herbal one was delicately flavoured with nutmeg, cardamon, and dong quai. It was a delicious and filling feast indeed! Sunday, we went to visit Mr Leaf's family. We went out for lunch at a Vietnamese Restaurant, Loong Kee on Kingsland Road, Hackney. 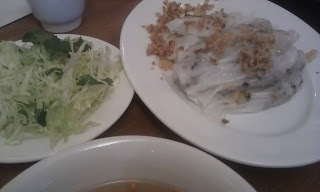 It's one of the few places that serve Steamed Rice Rolls Bánh cuốn which is a favourite with Mr Leaf. They are similar to Cheung Fun but the rice skins are thinner, more translucent and not as soft. 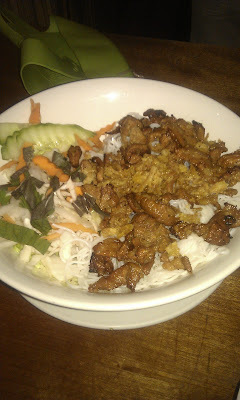 The filling was a scarce scattering of minced pork and minced black wood ear fungus. Was not very flavourful on its own and needed the Nước chấm sauce to give it some life. 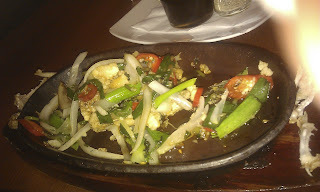 Mr Leaf's brother likes Frog's Legs so we ordered a starter of Fried Frog's Leg's with Salt and Chilli. The frog meat tastes between fish and chicken. Mr Leaf and his brother always eat this noodle salad dish Bún Thịt Nướng which is topped with grilled pork. It's rice vermicelli with shredded salad, herbs and whatever topping you select and sprinkled with roasted crushed peanuts (which they did not have in this place.) You moisten it with Nước chấm mix it up and chomp away. This is not where we usually go for our Vietnamese meals and Mr Leaf reported the pork not the same cut and taste as his usual choice of restaurant. I opted for stir-fried rice noodles with mixed meat. Expecting Ho Fun wide, flat rice noodles like I would in a Chinese Restaurant I was surprised to get very thin rehydrated noodles. It had a pleasant chew to them and I had all manner of different vegetables stir fried with it (no bad thing in my book). Son managed to eat a few mouthfuls too so that was a bonus as he is a very discernible diner. Sister in Law (Mrs Leaf) had Beef Phở. 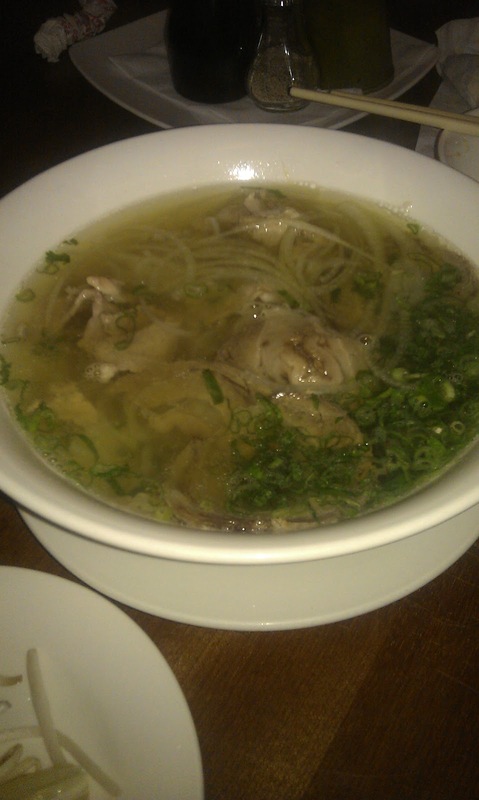 Noodle Soup in a beef broth with sliced onion, herbs, thinly sliced beef. 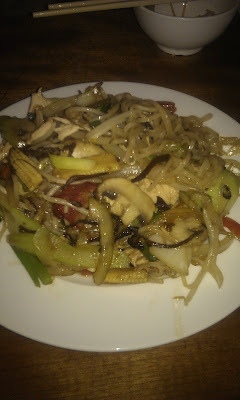 It's served with a plate of accompaniments, herbs, raw beansprouts and a lemon wedge. 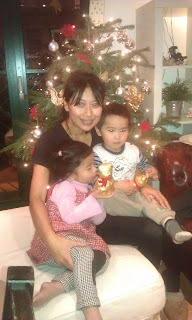 In the evening we went to my SiL cousin's house for a pre-New Year Dinner. We had Coquille St Jacques to start (oops - no photo) which is a French dish of scallops in a white wine sauce served in the half shell topped with mashed potato and grilled. Mains were Steak or Thai Chicken Curry. Here are a few photos I did remember to take! 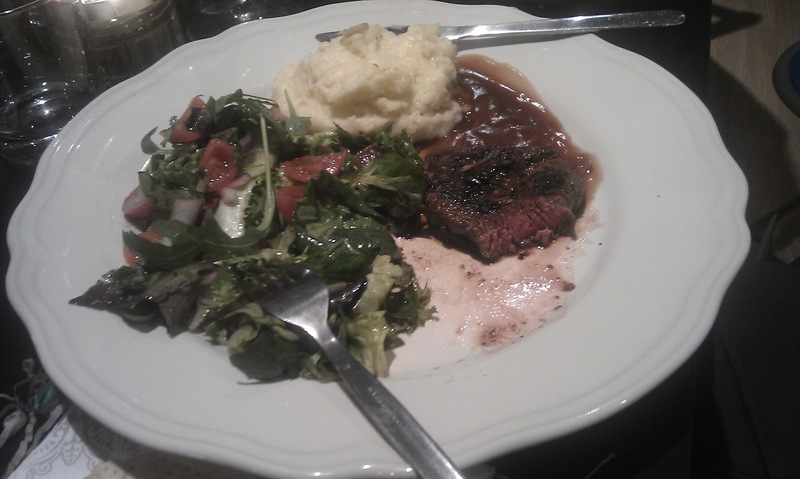 Pan-Fried Steak with mixed salad and mashed potato. I had the Thai Curry, there was Red and Green Curry and I had a little of both. 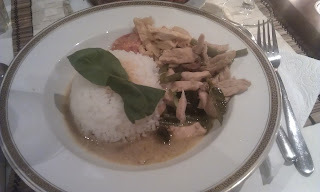 The Green Curry was particularly fiery hot but wonderfully fragranced with kaffir lime leaves, I couldn't tell you how the Red Curry tasted as my mouth was on fire after that! We had Christmas Cake for dessert (which I had made and decorated) as well as Strawberry Gateau (I believe it was a shop-bought frozen dessert). I hope you all had a lovely time celebrating the festivities with your nearest and dearest! The hostess pictured with my son and his cousin. Happy New Year to you and your family, Lynne! Your Christmas cake looks very pretty! !